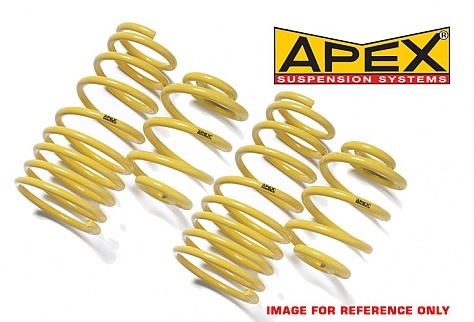 APEX Sport Spring kit easily replaces the standard springs on your car. It will usually lower the car by 30-40 mm. Not only will this improve your cars' handling, response and grip, but will add that extra touch of style that will make your car look different from the rest of the crowd. The ride will be a little firmer, say sportier, but never too harsh. Our aim has always been and always will be to deliver the best. Our modern state-of-the-art manufacturing plant and test facilities are operating under the stringent DIN ISO 9001:2000 quality control system. A lifetime, unlimited mileage warranty on our sportspring kits is proof of our quality commitment.